Mercedes-Benz Stadium broke records and earned countless superlatives before the Atlanta Falcons even took the field. The newest stadium in the NFL is also the most sustainable and the first to achieve LEED Platinum status in the U.S. As an integral part of the stadium’s luxurious aesthetics, over 200,000 sq. ft. of porcelain tile at the Atlanta Falcons Mercedes-Benz Stadium was installed using a premium system from Custom Building Products. 24” x 48” porcelain tiles were installed with MegaLite mortar in this space dedicated for use by the press covering games. This stadium has transformed the Atlanta skyline in iconic style with its one-of-a-kind retractable roof. Sightlines are paramount during football games, soccer matches and concerts, so this concept is carried through the transparent shell of the building. Sky bridges within the stadium provide views of downtown and visitors can also see inside before entering, adding to their sense of anticipation. The finish schedule reads like a Who’s Who of tile: 25 different international and domestic manufacturers are represented. This project perfectly showcases the synergy of tile and installation systems in a high-visibility, high-traffic environment. 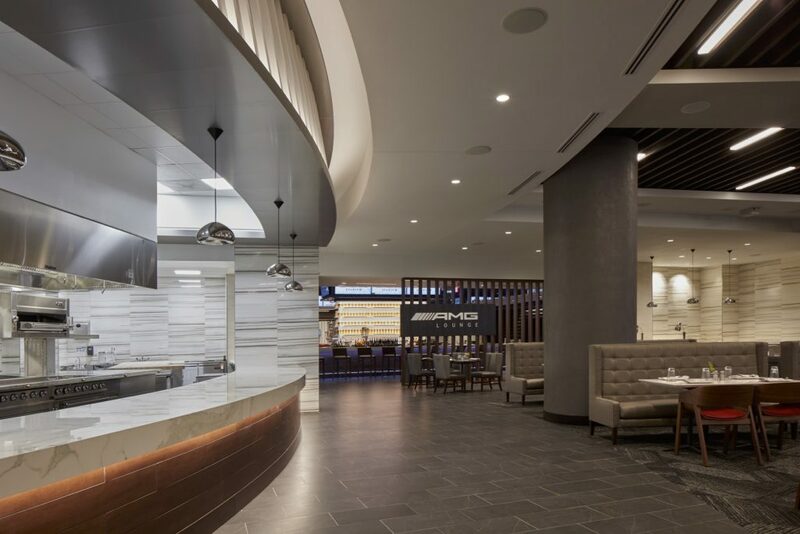 From 3D and textured tile to natural stone and gauged porcelain panels, all assemblies were installed to meet the demanding service conditions of a multi-purpose sports and entertainment venue. 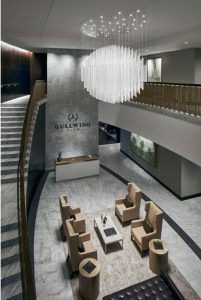 The exclusive Gullwing Club features white Carrara marble set on floors, walls and stairs with MegaLite premium mortar. 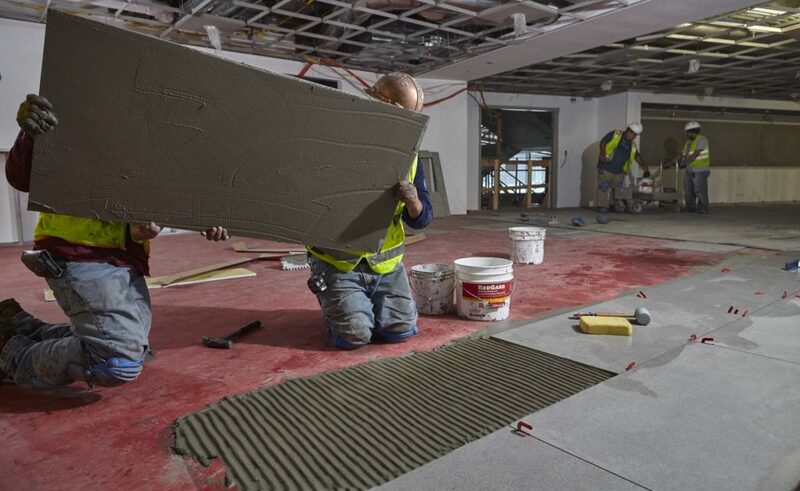 Surface preparation began with meeting the flatness requirements for large-format tile. Where concrete needed leveling, work started with an application of LevelQuick® Advanced Acrylic Primer. Then, Levelite® High Flow Lightweight Self-Leveling Underlayment was poured on suspended slabs to manage the accrued weight load. LevelLite is formulated with CustomLite® Technology, making it 40% lighter than standard cementitious levelers. LevelLite performed so well that the contractors used it throughout the project wherever leveling was needed. Gauged porcelain tiles were installed with ANSI A118.15 TE ProLite mortar in the premium guest spaces of the stadium. Pre-existing shrinkage cracks and saw-cut control joints in the slab were treated with CrackBuster® Pro Crack Prevention Mat Underlayment. Following TCNA Detail F125 Partial Coverage, they were spanned with a section of mat and new parallel soft joints were added to the tile assembly to relocate substrate movement. 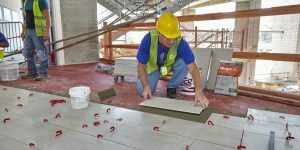 CrackBuster Pro is a self-bonding, fabric-reinforced mat that exceeds the high performance requirements of ANSI A118.12 and protects tile from in-plane movement up to 3/8” while providing an extra-heavy-duty service rating. 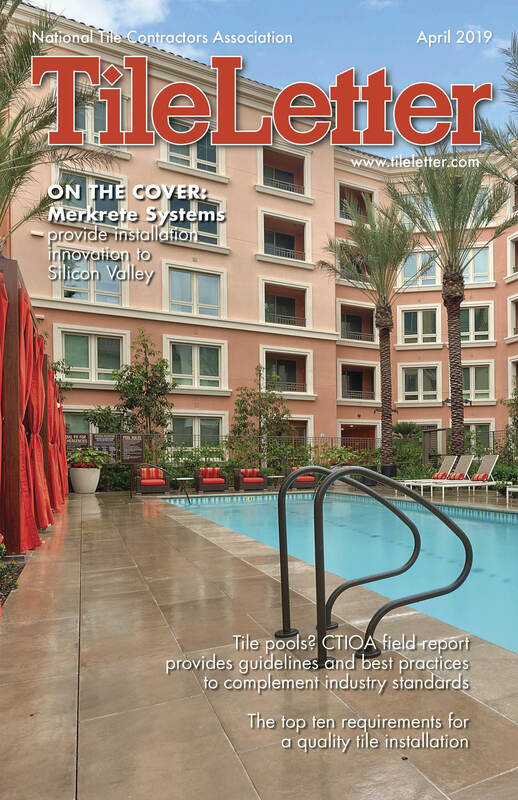 RedGard® Waterproofing and Crack Prevention Membrane was specified to perform two primary functions on the project. 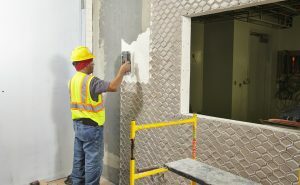 First, RedGard was applied in all wet areas, including showers and team locker rooms, to provide durable ANSI A118.10 waterproofing protection. Intermittently wet areas, such as kitchens and restrooms, also received two coats of RedGard. Secondly, RedGard was installed over concrete slabs to provide ANSI A118.12 crack isolation up to 1/8” and protect the tile and grout from horizontal substrate movement. These 3D tiles are among the many unusual materials used to add texture and depth throughout the project. RedGard is a ready-to-use elastomeric membrane that creates a continuous, monolithic waterproofing barrier. 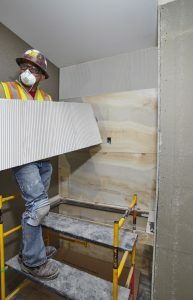 This versatile product exceeds ASTM E96 requirements as a low perm moisture vapor barrier for continuous use steam rooms and is listed with IAPMO as a shower pan liner. RedGard is rated for extra heavy duty use, anticipating the foot and wheeled traffic levels expected at the stadium. All tile on the project was installed using CUSTOM’s premium quality, lightweight mortars designed for large-format tile. CEG-Lite epoxy grout was used to grout all showers on the project including this team shower. and planks up to 48” long from Ceramic Technics. 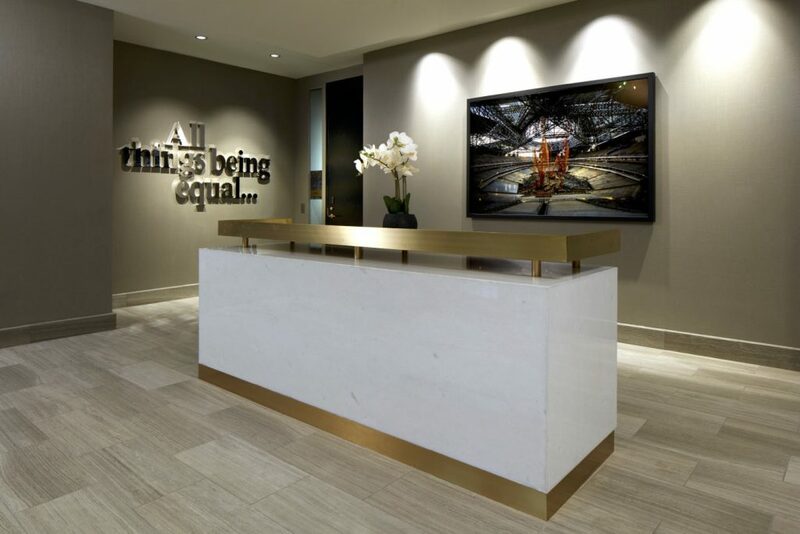 White Carrara marble slabs were installed using MegaLite on floors and stairs in the exclusive Gullwing Club. With bond strengths over 800 psi and high flexibility to help withstand substrate movement, MegaLite delivers unsurpassed performance for challenging service conditions. This non-sag, non-slump mortar was used to meet a variety of needs, from thin-set application with small ceramics on shower floors, to 3/4” deep placement for setting the large-and-heavy tile and natural stone at the site. All showers including this team shower received two coats of RedGard membrane for ANSI A118.10 waterproofing protection. ProLite® Premium Large Format Tile Mortar was specified for setting all wall tile. 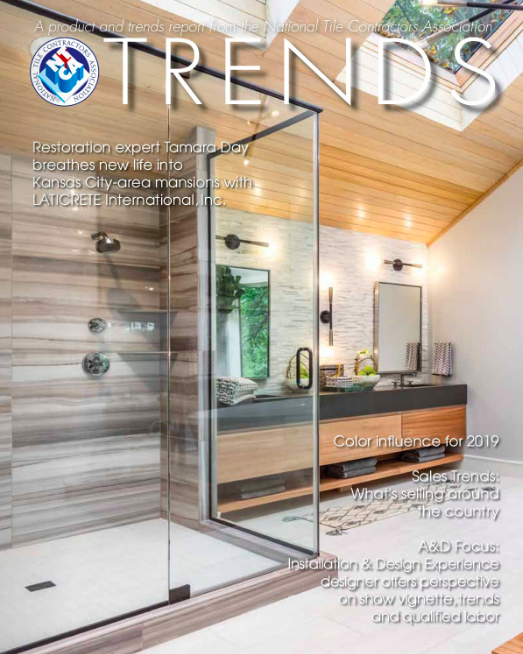 On a job of such scope – encompassing tile ranging from 30” x 60” and 60” x 120” gauged porcelain panels by Stonepeak and Transceramica in VIP spaces, to penny rounds and mosaics at beverage stations – ProLite performed with a range of bonding challenges. ProLite provides over 600 psi bond strength in a non-sag, non-slump formula that delivers superior handling. 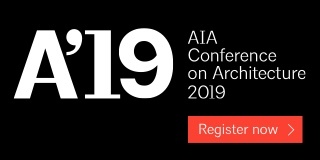 Both ProLite and MegaLite exceed ANSI A118.15 TE for thixotropic performance on walls and extended open time for adjustability. “The ProLite on walls and MegaLite on floors performed great!” said Gardner. High-performance grouts were specified throughout the stadium for beauty and durability. Prism grout’s nature-inspired palette of 40 colors allows exact color matching. Prism® Ultimate Performance Cement Grout was used to fill grout joints in all dry tiled areas. Prism’s calcium aluminate formula delivers uniform, consistent color without shading or efflorescence. This lightweight, rapid-setting grout meets ANSI A118.7 and is walkable in four hours. Prism creates dense, stain-resistant grout joints up to 1/2” and has a smooth consistency with excellent handling characteristics. All showers at the stadium, including the Falcons’ team shower, were grouted with CEG-Lite™ 100% Solids Commercial Epoxy Grout. CEG-Lite provides chemical and stain resistance with a fast cure time. The lightweight formula makes it easier to spread and clean than traditional epoxy grouts. Food preparation areas create a harsh environment for tile and grout, so kitchen floors received CEG-IG 100% Solids Industrial Grade Epoxy Grout, which delivers even higher chemical resistance. Movement joints and perimeter joints throughout all tile assemblies were filled with Commercial 100% Silicone Sealant for permanent flexibility and protection. “Our installation crews liked working with all of the CUSTOM products,” said Michael Wadsworth, Field Superintendant with Spectra Contract Flooring. RedGard membrane was used to provide ANSI A118.12 crack isolation protection over suspended slabs as well as on-ground slabs. The LEED Platinum-certified Mercedes-Benz Stadium earned the most credits ever for a professional sports stadium (88). 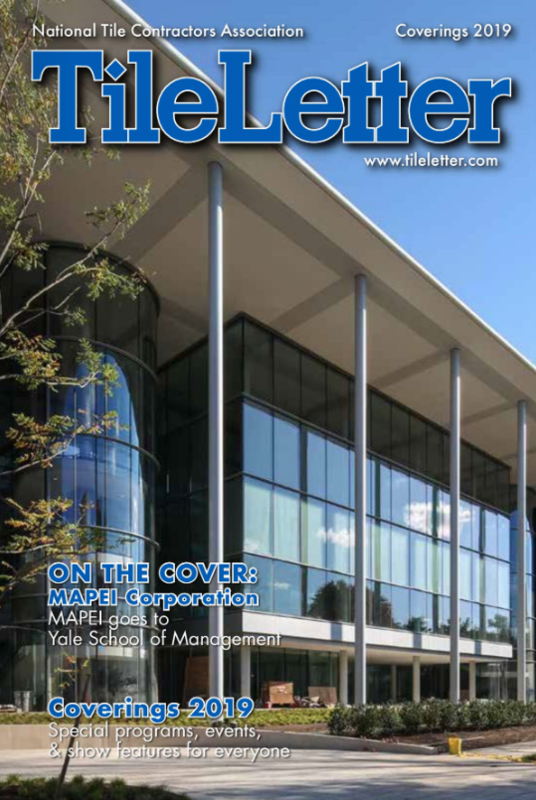 The project achieved this distinction through rigorous engineering and specification of qualifying materials. Five of the LEED-contributing products from CUSTOM – LevelLite, ProLite, MegaLite, Prism and CEG-Lite – are formulated with CustomLite® Technology. All CustomLite products incorporate lightweight, post-consumer recycled content in place of heavy aggregate sand. This makes products up to 40% lighter, so a 30-pound bag of ProLite covers the same square footage as a 50-pound bag of traditional mortar. These premium products are part of CUSTOM’s Build Green® family as well as the elite Emerald System® which qualifies projects for carbon offset credits. 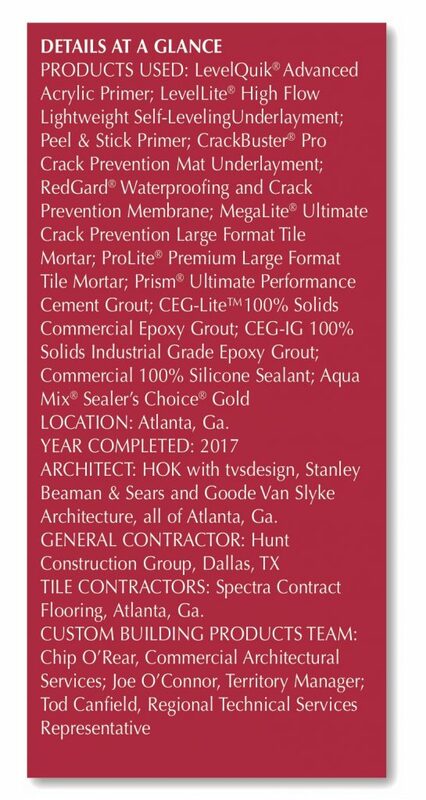 Specifications for the tile installation materials were written by Tony Riddle, former Senior Specification Writer at HOK. Mercedes-Benz Stadium will host Super Bowl LIII on February 3, 2019.